Pardon us while our site is under contstruction! We have new babies for 2013. Born June 9th. Click here for first pics - we'll have better ones soon. We are currently building our Nigerian Dwarf herd from various bloodlines that include Flat Rocks, Piddlin' Acres and Pecan Hollow. 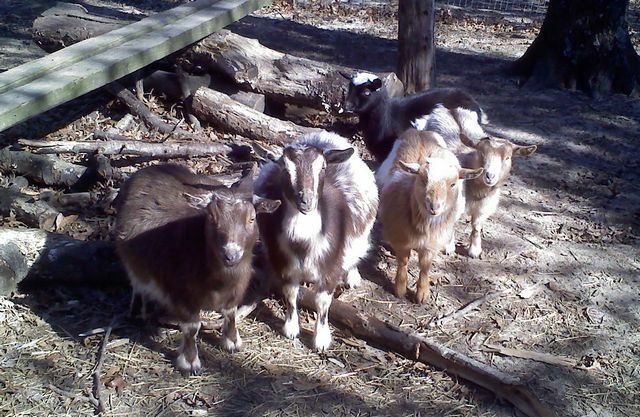 The goal is to raise quality, happy and healthy little goats that can produce a good amount of milk. Kids will be offered for sale along with possible stud service for those who do not own their own buck. FOR SALE: 2012 REGISTERED DOELING - Born on February 20, 2012. Has good milking potential. Brown, tan and white markings, blue eyes. Very friendly. Contact us for more information. $200. FOR SALE: WETHERS - Two available. Both are very friendly and make wonderful pets or companions to other goats. Must go to a great home! $75 each. In addition to the goats we also offer horse boarding and sell fresh, free-range eggs! Please remember to leave contact information. ©2012 Emerald Sun Farm. All rights reserved.